Do swarm cells make swarmy queens? Left to right: Bees swarming out. Swarm. Swarm (photo by Judy Lillie). Swarm being hived. Swarm Cells. Swarming is when the old queen and part of the bees leave to start a new colony. 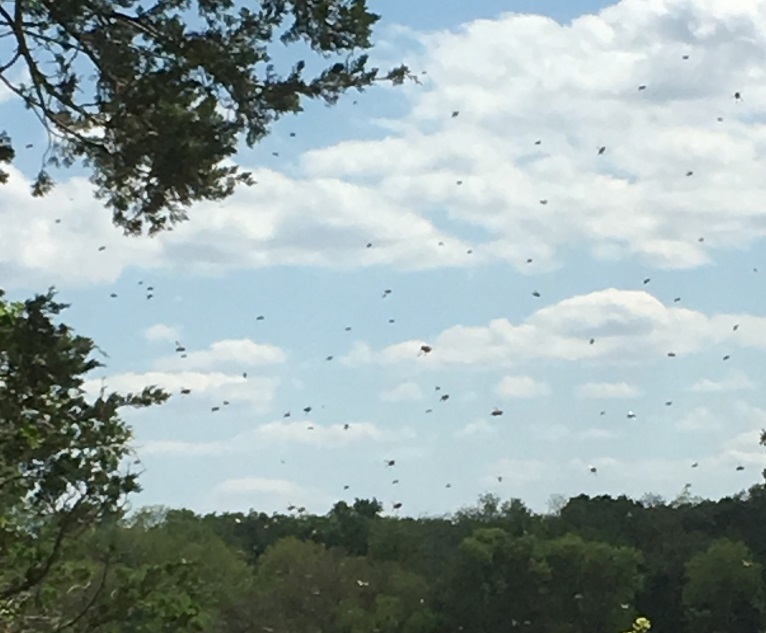 Afterswarms are after the old queen has left and there are still too many bees so some of the swarm queens (which are unmated queens) leave with more swarms. Sometimes a hive has a several afterswarms. Generally swarming is considered a bad thing because you usually lose those bees. But if you catch them it's a bonus because swarms are notorious for building up quickly. The bees are focused on it already and it's in the natural order of things. Back in the days of skeps and box hives it was always considered a good thing. It was a chance to make increase. It's good to realize that swarming is the normal response of a hive to success. It means they are doing well enough to reproduce the hive. It is the natural order of things. However, it is inconvenient for the beekeeper to have them swarm, so let's think about what causes them to want to swarm. First there are two main types of swarms. There are reproductive swarms and there are overcrowding swarms. There are a variety of pressures that push them toward swarming. No place to put nectar so it gets stored in the brood nest. Prevention: add supers. Honey or pollen clogging the brood nest so that the queen has no where to lay. Prevention: remove combs of honey and add empty frames so that the bees will be occupied drawing wax and the queen will have somewhere to lay and the bees will have more room to cluster in the brood nest. No place to cluster near the brood nest. The bees like to cluster near the queen (who is in the brood nest) and this clogs the brood nest making it crowded. Prevention: Slatted racks give room to cluster under the brood nest. Follower boards on the outside give room to cluster on the sides of the brood nest. These are a ¾" wide top bar with a sheet of plywood or Masonite or similar material in the middle the size of a frame. One on each end replaces one frame in the brood nest. Too much traffic congesting the brood nest. Prevention: a top entrance will give foragers a way in without going through the brood nest. So basically, if you keep supers on and provide ventilation you can prevent an overcrowding swarm. The bees have been working toward this goal since last winter when they tried to go into winter with enough excess stores to build up in the Spring before the flow enough to cause a swarm that will then have the optimum chance to build up enough to survive the following winter. The first mistake people make about preventing swarms is they think you can just throw on some supers and they won't swarm. But they will. Yes, it's nice to have room for them to store the honey, so the supers are helpful, but the bees intend to swarm and the supers will not deter them from the plan to do a reproductive swarm. Back to the sequence in the Spring, the bees, during winter, rear little spurts of brood. The queen lays a little and they start rearing that batch, but they don't start any new brood until that brood emerges and they take a break. Then they rear another little batch. When pollen starts coming in they start to rear more brood to build up. They also start using up the honey they have stored. This is used to feed brood and also it makes room for more brood. When the bees think they have enough bees they start filling all of that back in with honey, both to stop the queen from laying, and to have adequate stores in case the main flow doesn't pan out. As the brood nest gets backfilled it makes more and more unemployed nurse bees. These nurse bees start doing a keening buzz that is quite different from the typical harmonious buzz you usually hear. More of a warble. 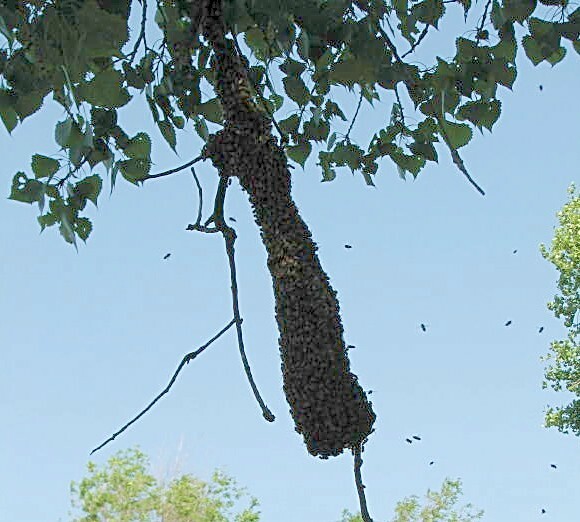 Once the brood nest is mostly full of honey they start swarm cells. About the time they get capped the old queen leaves with a large number of bees. Even if you catch the swarm, the hive has still stopped brood production and has lost (to the swarm) a lot of bees. It's doubtful it will make honey. If there are still enough bees, the hive will throw afterswarms with virgin queens heading them. If I don't catch them in time, once they make up their mind I always make splits because not much will dissuade them. Destroying queen cells only postpones the inevitable and most likely leave them queenless. My guess is that most people destroy the queen cells AFTER the hive has swarmed without realizing it. If you catch them trying to swarm between about two weeks and just before the main flow, a cut down split with the old queen and all but one frame of the open brood in a new location is a nice swarm prevention method. Leave the old hive with all the capped brood, one frame of eggs/open brood, no queen and empty supers. Usually, the old hive won't swarm because they have no queen and hardly any open brood. Usually the new hive won't swarm because they have no foragers. This is best done just before the main honey flow. I often just put every frame that has some queen cells on it with a frame of honey in a two frame nuc to get good queens. I have to admit, though, it depends on your definition of swarmy bees. If a hive is trying to swarm under normal circumstances and in normal amounts (a primary and possibly a secondary) I don't consider that "swarmy". If they swarm and afterswarm and afterswarm until there are no bees left, I consider that "swarmy". Those I do not want queens from. Of course, the real object is to avoid the swarm and the split (unless you want to do the cutdown split) so you'll have a bigger stronger hive that will make more honey. Distinguishing supersedure cells from swarm cells. There is a myth that supersedure cells are always in the middle and swarm cells on the bottom of the frames. This may be a good generality, but you need to look at the entire context of the situation. I would assume that queen cells on the bottom were swarm cells if the hive is building up quickly and is either very strong or very crowded. On the other hand if they are not strong or crowded and building, then I would assume they are not swarm cells. If the cells are more in the middle and conditions otherwise would cause me to expect swarm cells, then I would tend to view these as swarm cells. If the hive were not building and not crowded I would assume they are supersedure cells or emergency cells. Also swarm cells tend to be more numerous. To put it another way, you should be looking for the underlying causes of swarming. If none of them are present they are probably not swarming, they are probably superseding. 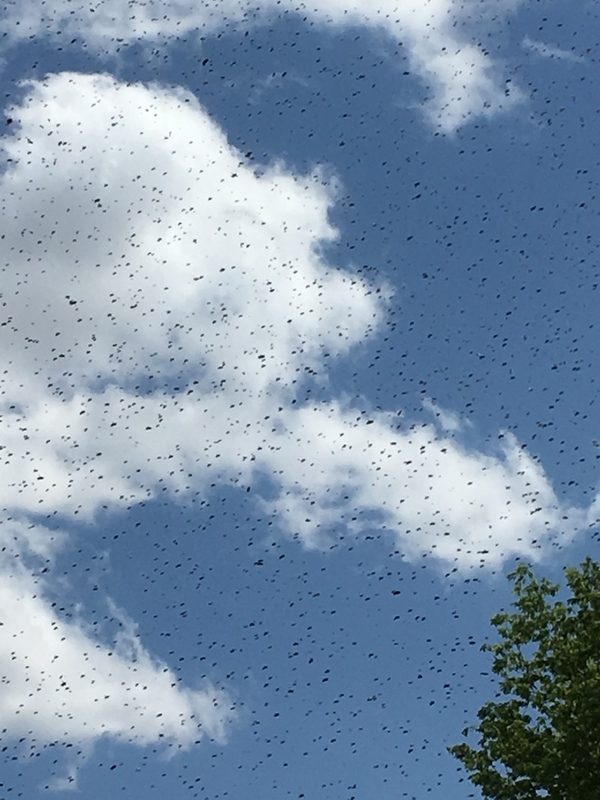 If many of those swarm triggers and signs are present, they are probably swarming, not superseding. Those triggers and signs include the time of year, crowding, rapid growth, lots of drone brood and backfilling of the brood nest. Also swarm cells are not all the same stage of development. Supersedure cells usually are the same age. Emergency cells are usually all the same age. I do love to catch swarms but who has time to watch the hives all the time to catch them? And if you have that much time, then you have the time to prevent them. This, of course is what we want to do. What we need to do is interrupt the chain of events. The easiest way is to keep the brood nest open. If you keep the brood nest from backfilling and if you occupy all those unemployed nurse bees then you can change their mind. If you catch it before they start queen cells, you can put some empty frames in the brood nest. Yes, empty. No foundation. Nothing. Just an empty frame. Just one here and there with two frames of brood between. In other words, you can do something like: BBEBBEBBEB where B is brood comb and E is an empty frame. How many you insert depends on how strong the cluster is. They have to fill all those gaps with bees. The gaps fill with the unemployed nurse bees who begin festooning and building comb. The queen will find the new comb and about the time they get about ¼" deep, the queen will lay in them. You have now "opened up the brood nest". In one step you have occupied the bees that were preparing to swarm with wax production followed by nursing, you've expanded the brood nest, and you've given the queen a place to lay. If you don't have room to put the empty combs in, then add another brood box and move some brood combs up to that box to make the room to add some to the brood nest. In other words, then the top box would probably be something like EEEBBBEEEE and the bottom one BBEBBEBBEB. The other upside is I get good natural sized brood comb. A hive that doesn't swarm will produce a LOT more honey than a hive that swarms. This should be done anytime in the spring when the nights are no longer frosty and when you observe the brood nest getting clogged with honey and the brood nest contracting instead of expanding, while the population of bees is peaking and before they start building swarm cells. Checkerboarding is a technique from the late Walt Wright that involves interspersing drawn and capped honey over the brood nest. It in no way involves the the brood nest itself. This is a method that also fools the bees into believing that the time has not yet come to swarm. It works without disturbing the brood nest. Basically it's putting alternating frames of empty drawn comb and capped honey directly ABOVE the brood nest. There is more on checkerboarding here: Experiment and on Beesource.